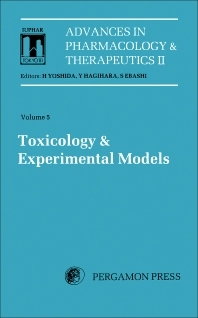 Advances in Pharmacology and Therapeutics II, Volume 5: Toxicology and Experimental Models is the fifth of a six-volume compilation of the scientific papers of invited speakers of the Eighth International Congress of Pharmacology. Organized into six parts, this book begins by elucidating the rational interpretation of species and strain differences in toxicity for the prediction of risk to man. Subsequent parts discuss the chemical interactions resulting in liver and kidney injury; the role of heme synthesis and degradation in predicting drug toxicity; and delayed toxic effects of pre- and perinatal drug exposure. Other chapters describe models of experimental peptic ulcers and therapeutic agents and models and quality control of laboratory animals. Can the mechanisms of aspirin-induced gastric mucosal injury be identified?